The Diocesan Penitentiary for Friendless and Fallen Women, later known as St Thomas' Home for the Friendless and Fallen, was established in 1864 following a proposal by Admiral Sir Alfred Phillips Ryder. Its aim was to provide a convent-based home for penitent 'fallen' women from the Diocese of Winchester and to provide them with 'the chance of recovering the character they have lost before God and society.' The institution was run by members of an Anglican order, the Sisters of Charity, on behalf of the Church Penitentiary Association and was originally based at Hardway, near Gosport. 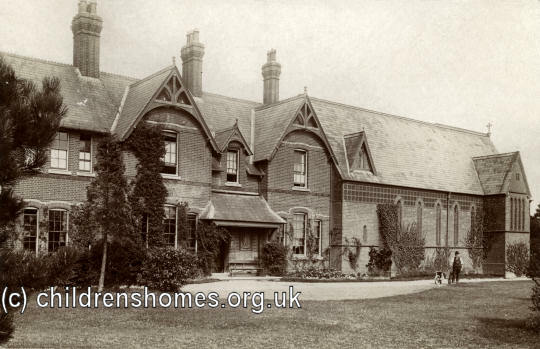 In 1874, purpose-built premises for the Home were constructed on a five-acre site at Darlington Road, Sherborne Road, Basingstoke. Accommodation was provided for up to 48 young women, aged from 15 to 30 years. Inmates were expected to remain two years and were trained in needlework, laundry and dairy work, and cooking. A new chapel, designed by Henry Woodyer, was dedicated by the Bishop of Winchester on July 21st, 1885, the eve of St Mary Magdalen's Day. A number of refuges associated with St Thomas' were subsequently established elsewhere in the county at Southsea, Southampton, Gosport, Guildford, and Aldershot. In the 1920s, the Home had financial problems. These were exacerbated when the diocese was divided in 1927 and the Home closed in the same year. The site was then taken over by the Sisters of Transfiguration and became the Mount Tabor Certified Institution, accommodating females placed there under the terms of the 1913 Mental Deficiency Act. By 1949, the premises were known as St Thomas's Lodge and housed an 11-bed shelter and before-and-after care home for pregnant young women from the local diocese. The establishment was run by the North Hants Moral Welfare Association. The premises were then sold to the County Education Department and from 1951 to 1985 housed St Thomas's School for the Deaf. The site is now occupied by a care home for the elderly. Hampshire Record Office, Sussex Street, Winchester SO23 8TH. Holdings: Minute Book of Meetings of the Home (1908-46); Executive Committee Minute book (1919-28); Log books and administrative files (1962-85). Bigg-Wither, R.F. History of the Foundation and of the Chief Incidents in the Gradual Establishment of St Thomas' Home, Basingstoke (1887).